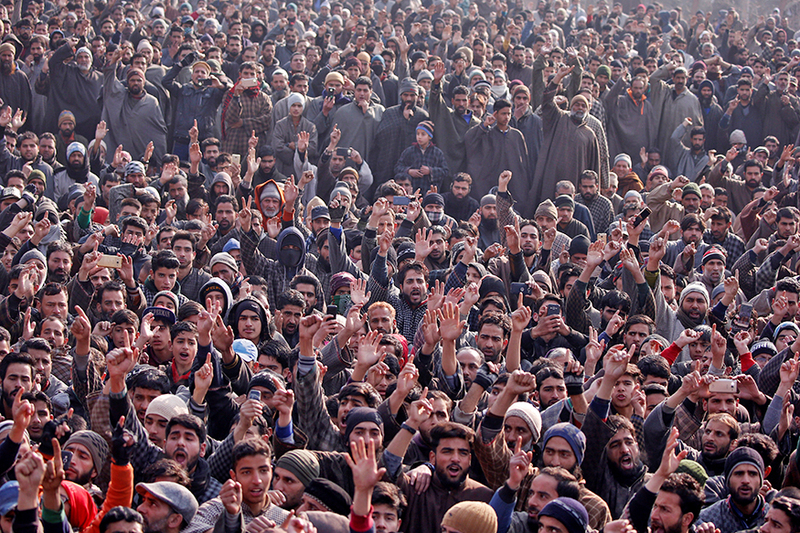 Srinagar, January 10 (KMS): In occupied Kashmir, thousands of people participated in the funeral prayers of a martyred youth, Farhan Wani, in Kulgam district, today. Farhan was killed by Indian troops during a cordon and search operation in Kokernag area of Islamabad district, yesterday. Multiple rounds of the funeral of martyred Farhan Wani were held at his native village in Khudwani area of the district. The Chairman of All Parties Hurriyat Conference, Syed Ali Gilani, who continues to remain under house arrest for the past many years, addressed the mourners over phone from his Hyderpora residence in Srinagar. The youth was buried amid pro-freedom, pro-Pakistan and anti-India slogans. Complete shutdown was observed in Islamabad and Kulgam districts to mourn the killing of Farhan Wani and another youth, Khalid Ahmed Dar, by the troops. Khalid was martyred when the troops opened fire on protesters in Khudwani area of Kulgam district, last evening. All shops and business establishments were closed while traffic was off the road in the two districts. The Joint Resistance Leadership comprising Syed Ali Gilani, Mirwaiz Umar Farooq and Muhammad Yasin Malik in a statement issued in Srinagar, today, called for complete shutdown on Saturday to protest against the killings. The leaders said that Kashmir had been turned into a killing field where life and property of Kashmiri people was not safe from brutal Indian forces. The All Parties Hurriyat Conference in a statement in Srinagar said that India was not sincere in finding a peaceful and lasting solution to the Kashmir dispute. The APHC advised the policy makers in New Delhi to stop insisting on failed policies on Jammu and Kashmir. A speedy Indian army vehicle deliberately hit and killed a civilian, Muhammad Hussain Ittoo, at Vessu in Kulgam district. People took to the streets and demanded arrest of the culprit driver of the army vehicle. Pellet-blinded Kashmiri girl, Insha Mushtaq, has passed her 10th class examinations. Insha was completely blinded after she was hit by the pellets fired by Indian troops while she was inside her home on July 12, 2016 in Shopian. APHC-AJK leaders including Ghulam Muhammad Safi, Ishtiaq Hameed, Shamim Shawl, Aijaz Rehmani and Imtiaz Ahmed briefed a French media team in Muzaffarabad about the atrocities of Indian forces in occupied Kashmir.